The United Kingdom mainlands is made up of England, Wales & Scotland forms the largest Island in the whole of Europe. Britain has a total of 6,000 miles or 9,655 km's of coastline to enjoy. The beautiful coastline is very varied and included cliffs, headland, shingle beaches, sandy beaches, rocks and marshland - so there really is something for everyone. As an island nation, Britains coastline is rich in maritime history and there are pretty fishing villages and naval history to enjoy around the coast. Click on the map to search for coastal holiday cottages in England, Wales & Scotland. Weather you are looking for a coastal cottage for a family holiday or a special occasion such as a honeymoon, wedding anniversary or a birthday we have a wide selection of cottages to meet every need. 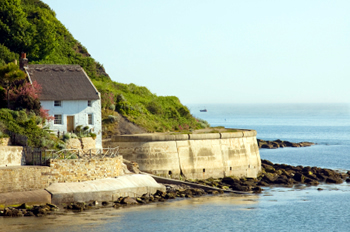 Coastal Cottages are for people who want something extra special in a holiday. Our coastal holiday collection has everything a discerning holidaymaker looks for in their coastal holiday. Many of the properties have well private gardens, hot tubs, coastal finishes. So why not treat the special people in your life to a coastal holiday to remember at a quality cottage. For an idyllic holiday by the sea for you and your family you may want a luxury holiday cottage near a sandy beach. Just click on the map to the right to see cottages that are situated not only near the sea but also close to a sandy beach. A summer holiday on the beach is a great way to relax with your family. British beaches have a lot to offer for holiday makers of all ages. Sandy beach resorts are a hive of activity for night life, good food, water sports as well as just relaxing and soaking up the sun. Booking your accommodation is pretty straight forward. All you need to do is click on the property that you like to see full details. You can then use the book now or availability links to get up to date prices for your holiday as well as see which weeks are available to book. We are an independent site and bring you holidays from many different providers to ensure you get the widest possible choice and best value for money. If you plan to travel to your accommodation using public transport such as rail or aircraft then a hire car can help you visit some of the wonderful countryside or coastal areas near many of the properties. There are many advantages to taking a break in the UK including the exchange rate, cost of travel and its green credentials through less traveling. If you do want to go overseas for better weather then a villa is a great choice as you get the space and privacy of a cottage and often villas have swimming pools on site. Subscribe to our newsletter and get news & offers about cottage holidays in your inbox.